Learn with Debbie Diller to develop more meaningful, standards-based literacy work stations for your K–3 students. At the end of this self-paced, six-lesson online course, you will be able to make connections naturally between your state’s ELA standards and what you’re teaching in whole-group mini-lessons and in literacy work stations. Get details on the graduate credit option available through Brandman University, available now! 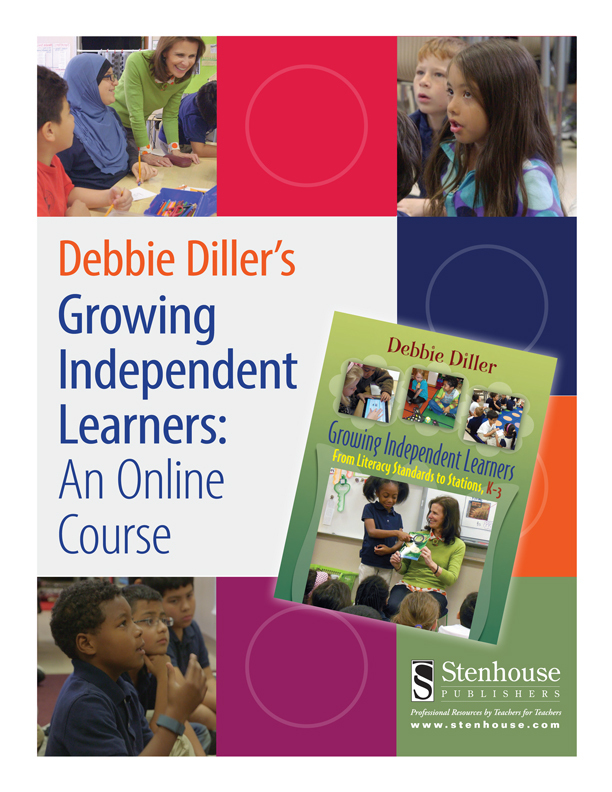 Online Course & Book Bundle includes a copy of Growing Independent Learners. Contact Customer Service for group ordering info! teaching key skills that allow students to work together toward independence, ownership, and mastery. Each lesson comes with downloadable readings and high-quality videos that show instruction and teacher planning. A dedicated Facebook Group allows you to connect with other teachers, share insights, and discuss assignments. Debbie will visit the discussion board periodically to add her own comments to the conversation. At the end of the course you will receive a certificate of completion that shows eight clock hour credits. Growing Independent Learners is required reading to go along with the workshop. If you do not own the book, we recommend ordering the online course and book bundle; see above ordering options. Click here for more information on Growing Independent Learners. My favorite part about the course was being able to work at my own pace and being able to go back and look back at things that I wanted to view again. Part 1 Why use the team planning tool? My favorite part was definitely learning how to use anchor charts more effectively as well as learning how to teach informational texts and new vocabulary.